The AirGate-3G Modbus Gateway is a cellular router for Internet of Things (IoT) applications and provides remote access to local networks. 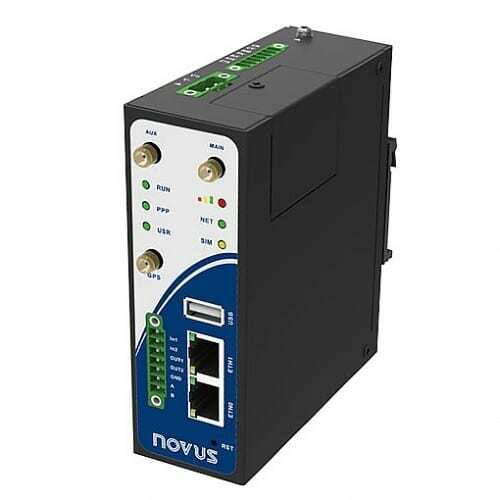 It acts as a Modbus RTU master and reads up to 64 registers of Modbus remote channels. All data generated can be published on the NOVUS Cloud platform, which allows access anytime and anywhere, besides providing efficient and reliable storage. The Novus Cloud Gateway provides a new way to store, analyze and export historic data from remote or local processes. Acting as a simple packet router or online data storage server, the Cloud Gateway offers an intuitive web interface that allows users to view recent data, connection status, reports and also system exceptions of all remote telemetry points. View all measurement groups associated with the account. View all measurement points and a summary view of all sensor inputs withing the measurement group. Customizable icons for sensors, current values and historic data. Notification alerts can be set for all configured sensors. Low and high alarms and communication errors can generate alerts that will be sent by e-mail or SMS to a user defined mobile phone number. Sensors can be added to a chart for analysis, with the analysis interval configurable. Report intervals can be configured and can then be exported to .xls and .pdf files for further analysis.